Peacock House01485 534551work Guest AccommodationIn our large Victorian house we offer a quiet and peaceful stay. Our high class large spacious rooms have wonderful sea views, as we are situated just a two minute walk from the seafront, yet only five minutes from the town centre. All rooms are en-suite and well appointed with many little added extras including LCD TV/CD/DVD & freeview. A wide and varied breakfast menu including homemade breads and preserves. There is a guest fridge available and fresh milk is provided. Our guest lounge has a log burning Aga fire, TV, books and games, offering groups a place to meet up and chat. 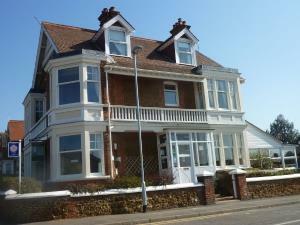 In our large Victorian house we offer a quiet and peaceful stay. Our high class large spacious rooms have wonderful sea views, as we are situated just a two minute walk from the seafront, yet only five minutes from the town centre. All rooms are en-suite and well appointed with many little added extras including LCD TV/CD/DVD & freeview. A wide and varied breakfast menu including homemade breads and preserves. Awarded TripAdvisor Certificate of Excellence Award for five years running. From Hunstanton roundabout on A149 take 2nd exit down Oasis Way, 3rd exit on seafront roundabout, 1st right into Park Road, 150yds up Park Road on the right-hand side. From Kings Lynn - 16 miles some buses run from station to Hunstanton.